In recent years marine insurance companies have taken a bit of hit as a result of the ferocity and frequency of hurricanes in the Caribbean. They all now require that yacht owners take certain measures to minimise the risk of hurricane damage - either to take their boats out of the zone altogether, or ensure that they store them ashore in such a way as to maximise protection. 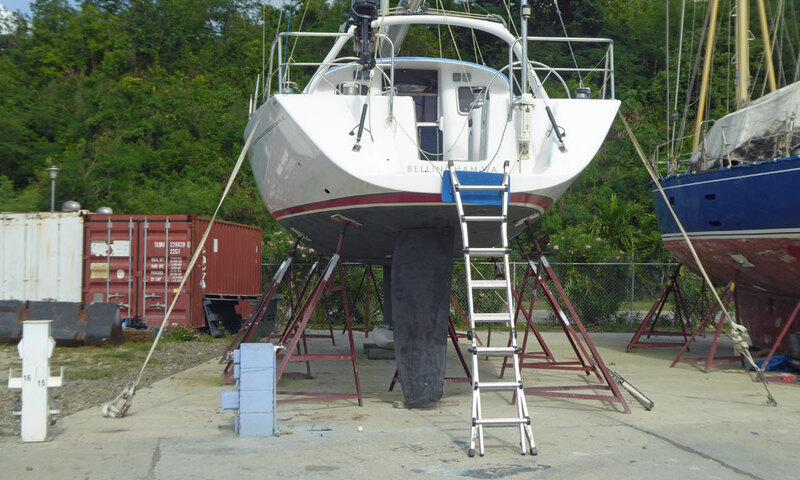 As a result most Caribbean boatyards offer 'Hurricane Season Boat Storage', but not all go far enough to meet the requirements of the various insurance providers. Neither are the requirements standard amongst the insurance companies themselves, so the top boatyards in this part of the world strive to provide the best possible protection for all boats left in their care. The obvious question is "Just how do they go about that?" Tripod stands (yet to be welded together with rebar) and tie-downs attached to ground anchors - almost ready to take on the coming hurricane season! 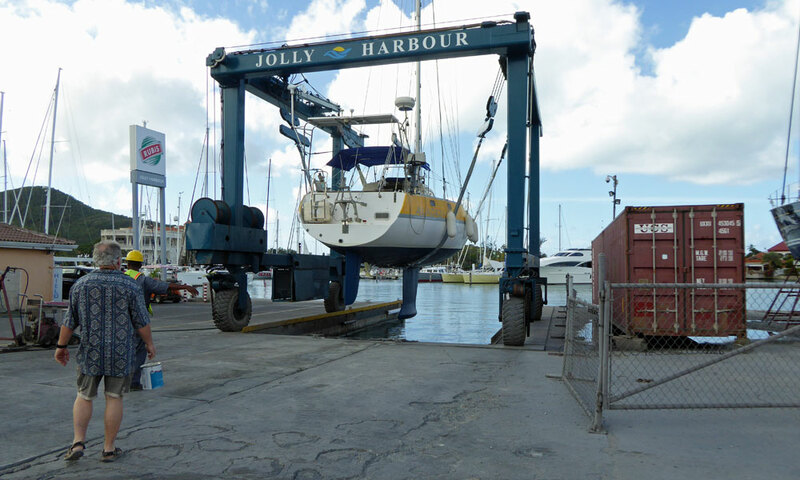 Whilst some Caribbean boatyards have a relatively small number of pits available, the vast majority of boats will be stored on the hard in a support structure of some kind - and it is this approach that we'll discuss here. 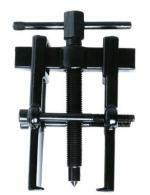 Tripod stands, welded together to form an integral one-piece support structure. Ideally this will be a concrete hardstanding, or compacted made-up ground. Soft, unmade ground is obviously not the way to go. These will be cast into the concrete hardstanding, or helical ground screws augored into made-up ground. Alternatively, moveable mass concrete blocks with anchor points cast into them are sometimes used. Webbing straps are the way to go here, incorporating some means of tensioning them. Rope is not suitable, as over time it will stretch and lose its initial tension. 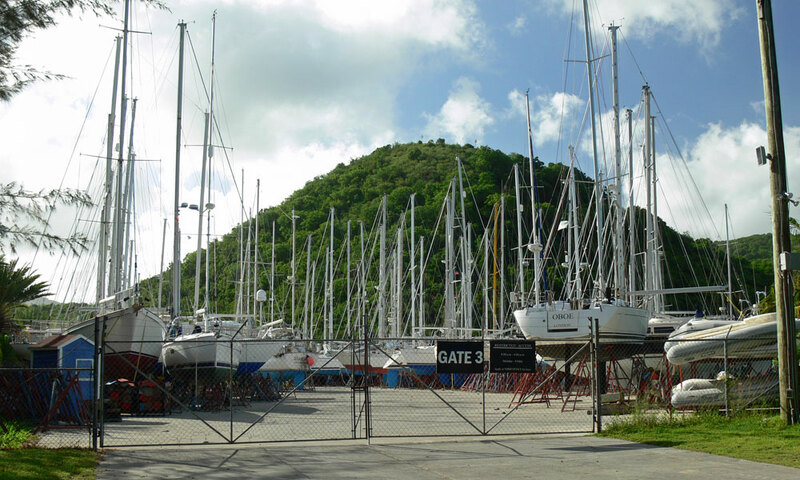 I discussed this with Jo Lucas, General Manager of Antigua's Jolly Harbour Marina & Boatyard. "That's fine for starters", she said, "but there's rather more to it than that". Jolly Harbour's scaffold storage shed for 56 dinghies. During the hurricane season, each dinghy is secured to the scaffold and the entire structure is strapped down to ground anchors. All boats must be strapped down to ground anchors. 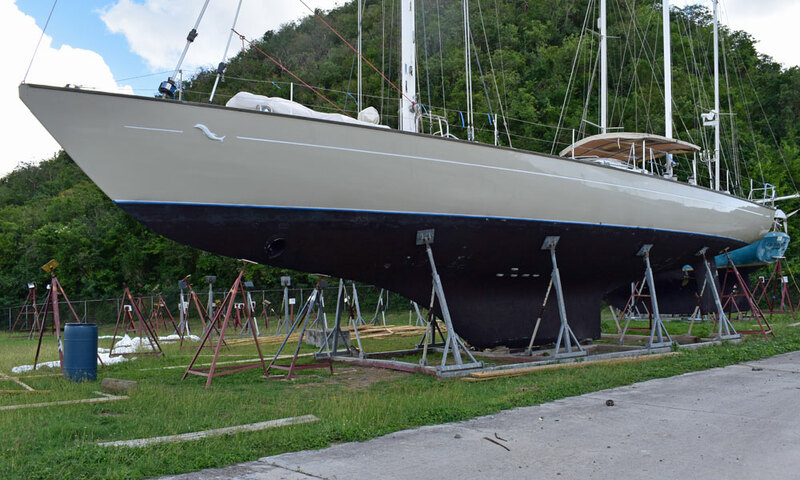 All canvas (sails, dodgers, awnings, spray hoods, biminis etc) must be removed. 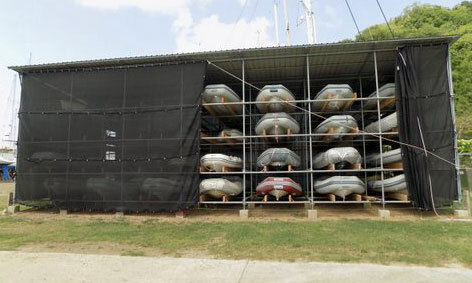 All dinghies must be removed for storage in our shed specifically designed and constructed for that purpose, or deflated and strapped down securely on deck. Ultimate security is provided by an adjustable steel cradle of a size suitable for the boat within it. However, all boatyards have a finite number available - boatowners are advised to book one early! Being rigid structures, cradles don't need to sit on a concrete base - they're quite happy on compacted ground. 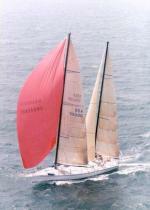 On larger boats - like the beauty below - cradles are supplemented by tripod stands to support the ends. All boats, whether in cradles or on tripod stands, are inclined slightly aft to assist drainage. Although the cradle is of an appropriate size for this 71 foot yacht, additional tripod stands have been used to provide extra support under the bow and the stern. If tripod stands are used on any base other than concrete, each of the three legs must be placed on a plywood pad at least 10mm thick. This spreads the load, absorbs any vibration and removes the possibility of any leg digging in. The smallest boat will need 7 stands, but most cruising boats need 9 while other larger boats may need 11 or 13. Stands must be placed to suit the hull shape, and near bulkheads to avoid undue loads on the hull. Once the boat has been positioned and the stands adjusted, they must be secured one to another with welded rebar. Standard welds passing under the boat are compulsory - even going under the keel if it's in the way. 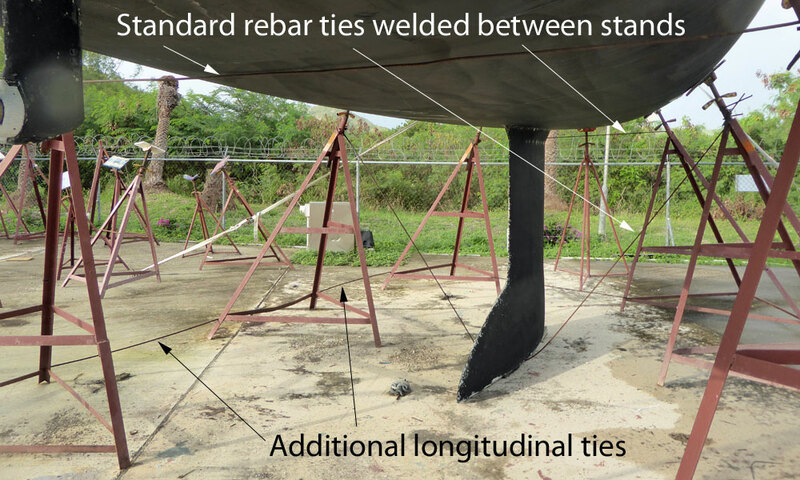 Lateral rebar welded from stand to stand linking them around the entire boat is optional. Tripod Stands are checked monthly as a minimum. After heavy rain, strong winds or earth tremors they are always checked. Each stand is welded to its opposite number with rebar passing under the boat. Most owners opt for the longitudinal ties in addition to the mandatory standard ties. First, let's dismiss the moveable mass concrete block approach - in hurricane conditions, 'moveable' is not what you want! We don't use them. 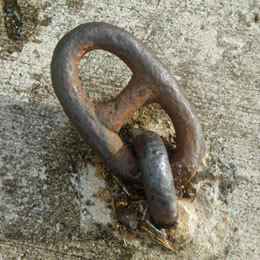 Nor is it enough to cast anchor points into the concrete slab itself. A proper job means cutting out a section of the slab, digging out the ground below and beneath the slab. 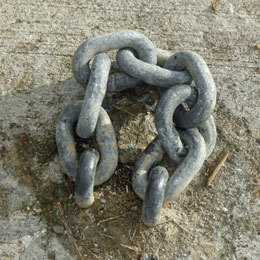 The anchor itself - usually very heavy duty chain or a loop of smaller chain - is placed in the hole and attached to rebar. The hole is than filled with concrete and the slab repaired, forming a solid concrete 'inverted mushroom' under the slab. That's one ground anchor that will never pull out. Similarly, helical ground screws of around 6 feet long will provide an effective and reliable anchor in compacted ground. A high-load shackle is attached to these to enable the webbing strap to self-align. The business end of a 6 foot long helical ground screw. The hi-test shackle allows the tie-down to take up its natural angle when attached and tensioned. A few owners ask that the boat is tied down to the cradle, which we're happy to do - the cradles have attachment points for this - but we always tie the boat down to the ground anchors as a first priority. 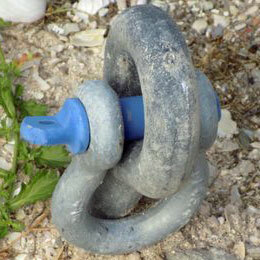 A minimum of 4 tie-downs per boat, angled to ground anchors, are required. If a suitable strong point - such as a midships cleat - is available, an additional pair of tie-downs are sometimes used. Our tie-downs are hi-test industrial cargo straps with ratchet adjusters. Incidentally, the twists in the webbing are intentional - in high winds these disrupt the airflow and reduce vibration. All tie-down straps and ratchets are serviced annually, or replaced with new if necessary. They're placed in such a manner that, should disaster strike, the domino effect of a falling boat is minimised within each category. Jolly Harbour has 2 yards, each with remotely operated security cameras, patrolling guards and controlled access. Yard 1 – main working yard used year round for short and long term storage and full access for all aspects of marine trades. Yard 2 – used primarily for for long term storage but is also now a working yard for all jobs except major paint spraying. Owners are permitted to live aboard and can work on their own boats. Outside contractors may only work under a daily work permit scheme. will contractors be working on boat etc, etc. Early launches get packed in front of later launches but are not limited to one yard or the other. Boats up for sale are grouped and placed in such a way that they are as accessible as possible in the event a sea trial is needed. Once a boat is in position and secured for the season, we email customers photos for their insurers and/or their own peace of mind. Photos of individual boats and the yards generally, are taken for comparison with post-hurricane photographs. Further daily countdown meetings are scheduled and appropriate actions taken. While internet service remains available, updates are emailed to all customers with a boat in the yard, throughout the season with regard to any storms – brewing, approaching and or having passed through.